100 min. Walt Disney Pictures. Director: Brian Henson. Cast: Tim Curry, Billy Connolly, Jennifer Saunders, Steve Whitmire, Dave Goelz. 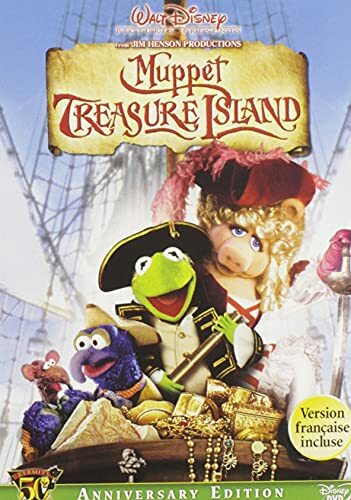 After the success of The Muppet Christmas Carol, director Brian Henson continued the Muppet trend of parodic remakes with Muppet Treasure Island, derived from the classic 1883 novel by Robert Louis Stevenson. Filmed at Shepperton Studios in London, Muppet Treasure Island gathers several hugely talented Muppet performers for a deeply "felt" performance: Frank Oz (Miss Piggy, Fozzie Bear, Sam the Eagle), Dave Goelz (Gonzo, Dr. Bunsen Honeydew, Waldorf), Steve Whitmire (Kermit, Rizzo, Beaker), Jerry Nelson (Statler), Kevin Clash, and Bill Barretta. The screenplay by Muppet vet Jerry Juhl, Kirk R. Thatcher (Muppets Tonight) and James V. Hart (Bram Stoker's Dracula) works out wacky variations on the strong frame of Stevenson's adventure. (Barry Mann and Cynthia Weil provide added value with pirate-themed songs.) This time, Gonzo and Rizzo are barmen in the ratty tavern of Mrs. Bluveridge (Jennifer Saunders of Absolutely Fabulous); their young, human, orphaned friend Jim Hawkins (bland Kevin Bishop) shares their musical dream of "Something Better." Something better arrives in short order when decrepit drunk Billy Bones ( a hilarious Billy Connelly) hands the three friends a treasure map promising high-seas adventure. They win the financial support of Squire Trelawney (Fozzie), a lunatic who believes a friend named Mr. Bimbo lives in his finger, and soon they're setting sail on the Hispaniola, captained by Abraham Smollett (Kermit). The scurvy-looking crew inspires little confidence: even friendly ship's cook Long John Silver (Tim Curry, having a grand old time) seems a bit too friendly. The songs "Sailing for Adventure," "Cabin Fever," and "Professional Pirate" happily spew pirate argot in humorous odes to seafaring. Miss Piggy shows up as Kermit's old flame Benjamina Gunn. When the two run afoul of Silver, Henson, Mann, and Weil literally turn the obligatory love ballad upside-down in "Love Led Us Here" (taken seriously, over the end credits, by dueting John Berry and Helen Darling). Mann and Weil's "Love Power," as recorded by Ziggy Marley & the Melody Makers, ends the film on some happy notes. The humor is up to Muppet par, with physical comedy, puns, running jokes, and layered gags. "He's some kind of a blind fiend!" says Rizzo of one scallywag; "I believe they prefer 'visually challenged' fiend," Gonzo replies. Whenever the movie threatens to take itself seriously for a moment, a gag deflates the tone to happy silliness. In a running gag, a bunch of rats enjoy the Hispaniola's journey as a pleasure cruise, Silver has a pet lobster named Polly (you were expecting maybe a parrot? ), and his henchman futilely attempt to torture the masochistic Gonzo. As ever, winking asides remind kids that it's only a movie. Muppet Treasure Island is grand family entertainment. Disney's "Kermit's 50th Anniversary Edition" of Muppet Treasure Island at last adds a widescreen DVD transfer (a tad grainy, but filmlike) to the previously available fullscreen transfer. Unfortunately, this ostensible special edition dispenses with a number of features available on the previous, fullscreen-only disc. Gone are the "Hidden Treasure Audio Commentary" with director Brian Henson and Gonzo and Rizzo, 22-minute making-of featurette "The Tale of the Story Behind the Tail," "Treasure Island Sing-Along" (with introduction by Gonzo and Rizzo and two songs—"Sailing for Adventure" and "Cabin Fever"—with sing-along captions). The motion menus with original Gonzo and Rizzo material remain from the previous release, and Disney adds a new featurette. "Pepe Profiles Presents—Fozzie Bear: A Long Day's Journey Into Night Clubs" (5:28) is worth watching for its handful of good bad jokes. Previews include Lady and the Tramp (2 Disc Special Edition), Disney's MovieSurfers hyping upcoming theatrical releases The Wild and Shaggy Dog, The Muppet Show: Season One Special Edition, and an ad for RadioDisney. The new, filmlike widescreen transfer is essential for Muppet fans, but the lost bonus features make this new disc a bit disappointing. Perhaps one day the film will get a proper special edition that removes the fullscreen transfer to make way for a full battery of special features. All site content © 2000-2019 Peter Canavese. Page generated at 04/18/2019 02:09:35AM.